Click on the image above for a full sized PDF to print. My first papercraft in a long time. Sorry you papercraft fans have had to wait so long! I’ll add several more before the Christmas. 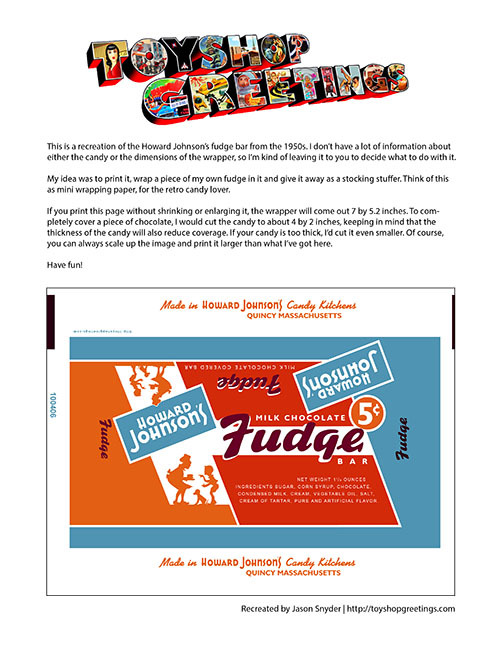 This is a recreation of the Howard Johnson’s fudge bar from the 1950s. I don’t have a lot of information about either the candy or the dimensions of the wrapper, so I’m kind of leaving it to you to decide what to do with it. My idea was to print it, wrap a piece of my own fudge in it and give it away as a stocking stuffer. Think of this as mini wrapping paper, for the retro candy lover. If you print this page without shrinking or enlarging it, the wrapper will come out 7 by 5.2 inches. To completely cover a piece of chocolate, I would cut the candy to about 4 by 2 inches, keeping in mind that the thickness of the candy will also reduce coverage. If your candy is too thick, I’d cut it even smaller. Of course, you can always scale up the image and print it larger than what I’ve got here.